FOOTBALL: Hello? Is this on? Pre-season Prep - Popovers. Yes. I know. It's been a while. I'd love it say that I've been super busy - or over compensating on other social mediums - but, sadly, that's not the case. It's just been I while since I've felt the motivation requisite for posting. But I've got it now - so here goes!!! Yorkshires Puddings have become a favorite item over the years. 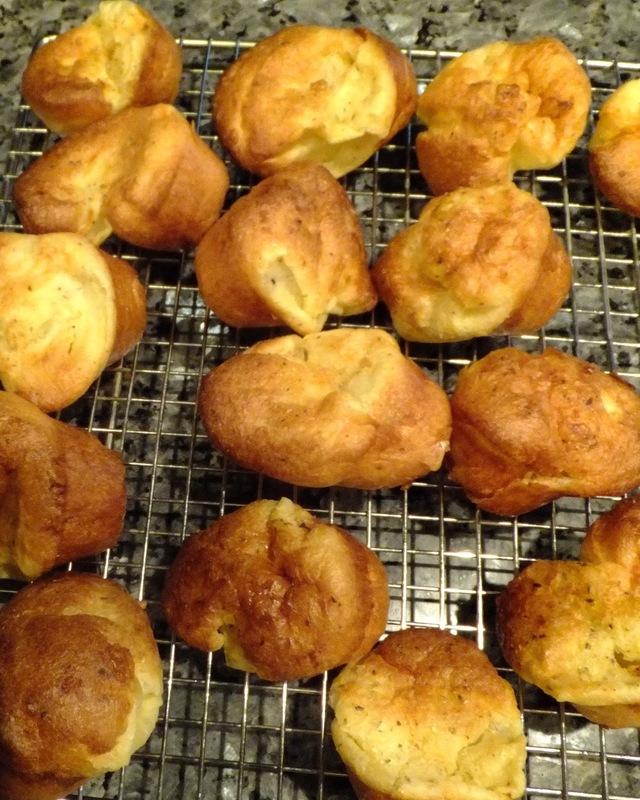 I love making them and they are oh so yummy - but this season we are not planning a beef centered tailgate - so I decided to make a batch of Yorkie's kissing cousin - the popover - to serve at our Irish themed tailgate. In a warm bowl, whisk together the milk, eggs, salt and herbs. If you are super strong, this can be done by hand; if you are a purist, use a rotary egg beater; if you are me, use a stand mixer with the whisk attachment. 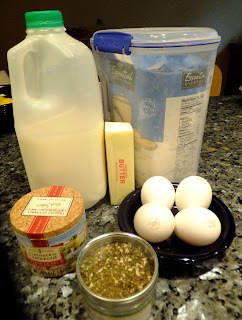 Beat the milk/egg/seasoning mixture until well combined. Add flour - all at once; combine (on low speed) and add the melted butter (I pass the butter through a sieve). So, what does thoroughly mean? The Joy of Cooking (from where we get the best Yorkshire Pudding recipe EVER) says to beat your batter until large bubbles appear (ie, a long time); King Arthur Flour says to mix until just combined (even if there are some small lumps). The difference between the 2 is that JoC has to let the batter rest while KAF goes straight into a hot oven. I go with the "let it rest" method - mixing/beating the batter until thick bubbles appear - and even mixing/whisking it a bit by hand and then letting the batter chill for at least a 1/2 hour (in a covered bowl). Remove the batter from the refrigerator and let it return to room temperature (really?!?!!? yes, really.). Set oven rack to lower rung and pre-heat oven to 450F. 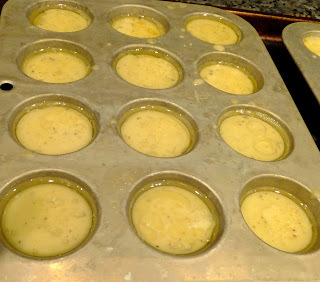 Dot mini-muffin pan (24) with 1-2 Tablespoons of butter (broken into small pieces). Basically, the entire bottom of each (muffin indent?) should be thickly coated. Once the oven comes up to temperature, Place (butter filled) pan into hot oven - 5 minutes (make sure butter doesn't burn). Similar to (other) bread baking, you want to make sure that your oven is *really* at temperature. Transfer batter into spouted bowl/measuring cup. 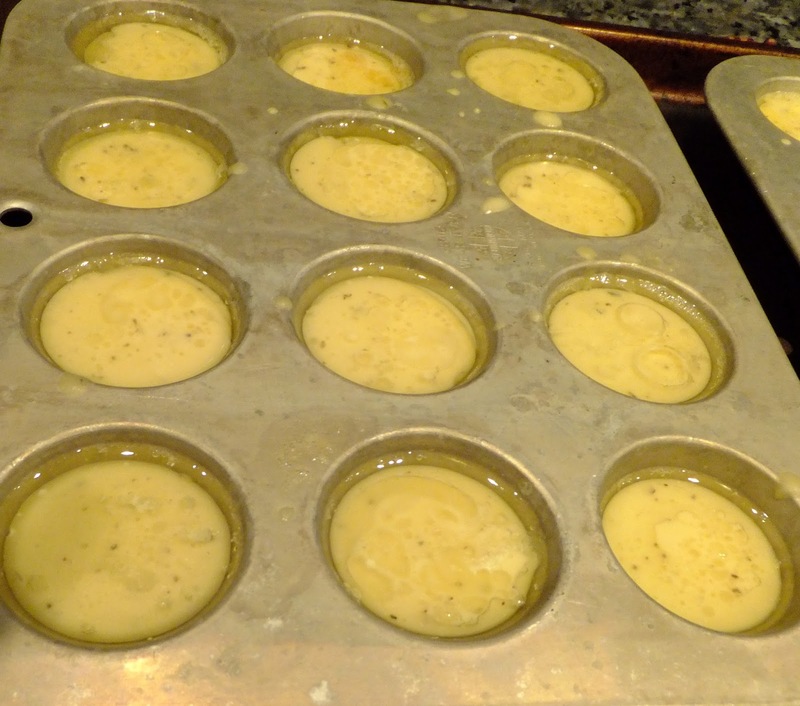 Remove hot pan from oven and immediately pour batter into pan - filling each 1/2 to 2/3 full. Reduce temperature to 350F and let bake for an additional 10 - 15 minutes (the cooking/browning stage) or until deep golden brown. Remove from oven and place pan on wire cooling rack. Pierce each popover discretely to help release steam. Return oven temperature to 450F. While waiting for oven to come up to temp, tip popovers out of pan and (devour, or) let cool on rack. If popovers are a little pesky (ie sticking to pan), gingerly persuade with sharp knife. Re-butter pan; heat 5 minutes; fill with remaining batter; cook 2nd batch same as first. If not eating immediately :( - let cool completely and transfer to airtight container/bag. Can be frozen. Makes 48 mini-popovers. Depending on the *mininess* of your pan(s) may make more or less. To revive - (thaw, if frozen, and then) put in oven (400F or whatever temperature you're cooking your other food will do) or on grill (indirect heat with cover closed) until crisp. Can be made with a variety of herbs/spices, cheese (sharp/flavorful cheese), sugar or just plain.